2016 saw Missouri River Relief grow in new ways, as we implemented new education programs with teachers and Columbia Public School students. We also shepherded more paddlers down the Big Muddy then ever before! I hope this year’s milestones will inspire you to consider making an end-of-year gift to Missouri River Relief. If you would like to contribute, please check out our Ways to Give page. Whether you write a check or donate online, your gift can help us kick-start into a new year!!! Education & Outreach events really moved to the forefront as we kicked off brand new educator workshops, a student summer camp and hosted our first ever "Missouri River Rendezvous" in Augusta, MO. 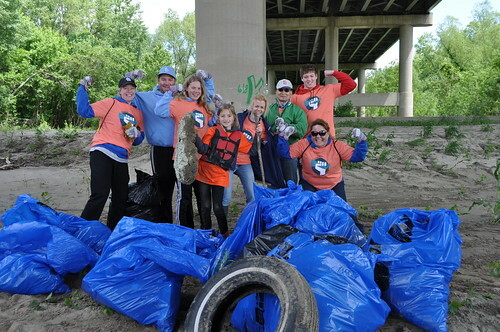 We focused our clean-up efforts on three massive community river clean-ups (see list on right) in New Haven, North St. Louis and Jefferson City this year (plus a bunch of smaller clean-ups, 20 in all). It was a great year! We appreciate all of the support our hundreds of volunteers and key sponsors and partners have been able to contribute to make the Missouri River a better place for generations to come! 15 years on the River, Thank You! Missouri River Relief took my breath away in 2016!! A whirlwind of new and exciting programs blossomed and I stood in awe at the persistence, talent and skill displayed by our community. Our education program grew with two exciting projects—a multi-day workshop for educators and a residential summer camp for teenagers. We hosted our first river conference—what I liked to call an “Un-Convention” for Missouri River action teams. And MRR became a funding source with mini-grants for organizations that are working on beneficial projects in the Missouri River watershed (read more on these new programs below). These new events are highlights from an extremely full and very fulfilling year for MRR. We maintained our drumbeat of river cleanups, boat trips, speaker series, booths and more—as you can see in our 2-page “Year-in-Review” report. Please accept our heart-felt gratitude for your help in making it happen—THANKS!!! Money from the two-year EPA Environmental Education Grant provided the financial foundation to boost our expansion. The EPA grant even provided $21,000 for MRR to award mini-grants to eight non-profit organizations. That’s a really nice place to be!! Giving money rather than asking for it. The $91,000 grant requires MRR to match $30,000 with donations from other sponsors. We are very grateful for the EPA baseline funding that bolsters our phenomenal growth into next year, too. MRR Education Coordinator Kristen Schulte worked closely with Jan Weaver of the Missouri Environmental Education Association to conduct a four-day professional development workshop in Boonville, MO. 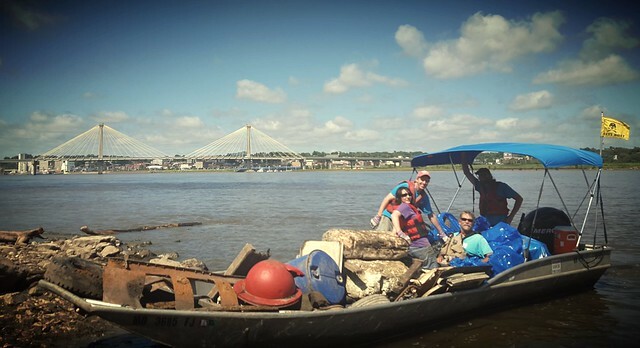 The extreme heat in June didn’t dampen the spirits of 10 eclectic educators who were eager to learn about the importance of the Missouri River and how to bring that lesson back to our youth. A total of 16 partners and 11 presenters deepened educator’s connection and sense of responsibility for the river. 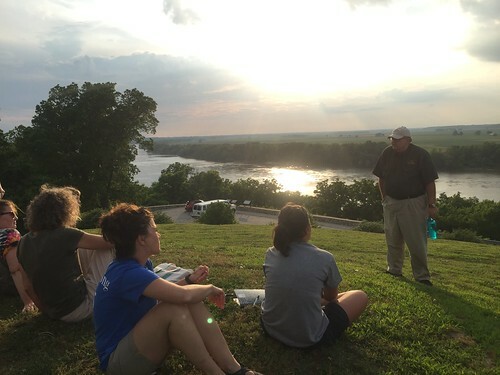 The Missouri River Academy was headquartered at Camp Trinity in New Haven, MO, and attended by 16 students. The experience provided a chance to engage their innate sense of wonder to explore the river while increasing their understanding about the longest river in North America! By deepening their sense of responsibility for the river, these young people will become the next generation of stewards. “My son is still bringing up things he learned and did,” a parent wrote. “Not only did he learn about the river, he learned teamwork, problem-solving and to look at the environment in a whole new way. The impact on his life cannot be understated. He seems more sure of himself and his love of science grew." The Rendezvous served as a gathering of community organizations and people who identify as friends of the river. The conference at Klondike Park near Augusta, MO, offered more than 100 people the chance to learn from each other and network with one another. Speakers gave 18 presentations on a variety of river-related topics. “I learned so much and felt super inspired by the end,” said a participant. “All of the extra activities like the pumpkin carving, campfire, hiking, boat rides, and canoe trip gave folks lots of options for a well-rounded river experience." I am so proud and humbled to be part of the community of people taking action for worthwhile causes on the river—it takes my breath away!! I invite you to join us— everyone has something valuable to contribute and there are many ways to help. It’s been a whirlwind of a year. Thanks so much for your continued support—we could not do it without you.